Kiev, Ukraine – Ukraine’s foreign ministry has condemned Russia’s plan to deploy a fourth S-400 surface-to-air missile battalion to the annexed Crimean peninsula amid a deepening conflict with Kiev. 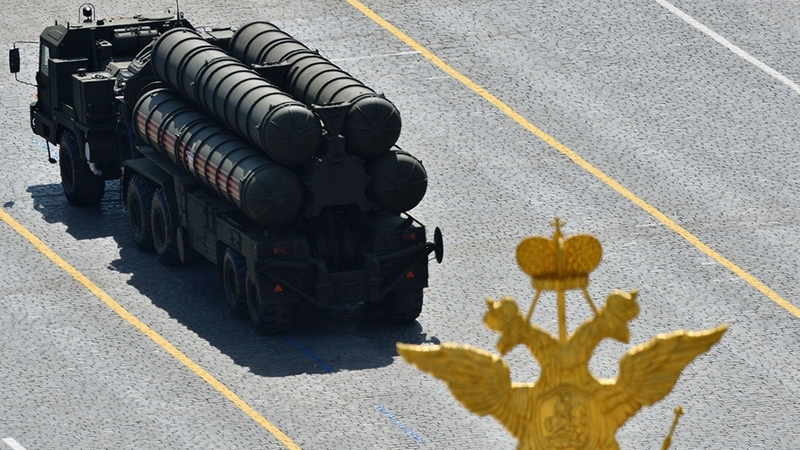 Earlier on Wednesday, Russia’s southern military district spokesman Vadim Astafiyev told Interfax news agency that S-400s would soon be deployed to Crimea. The system is expected to be operational by the end of the year, according to Russia’s RIA news agency. Olexiy Makeyev, the Ukrainian foreign ministry’s political director, told Al Jazeera on Wednesday that the development was “dangerous not only for Ukraine” but the whole Black Sea region. “The system’s operational range is up to 400km so it places all literal states in the Black Sea region, including NATO members under the threat of an attack. We know that those missiles can be used also for ground targets,” he said. Makeyev said that Moscow has been militarising Crimea since 2014 bringing in “new weapon systems including nuclear capable aircraft and missiles as well as military personnel”. “The occupation and subsequent militarisation of Crimea led to the expansion of the area of use of Russian warships and military aircraft in the Black Sea and far beyond, even the Mediterranean basin,” he said. 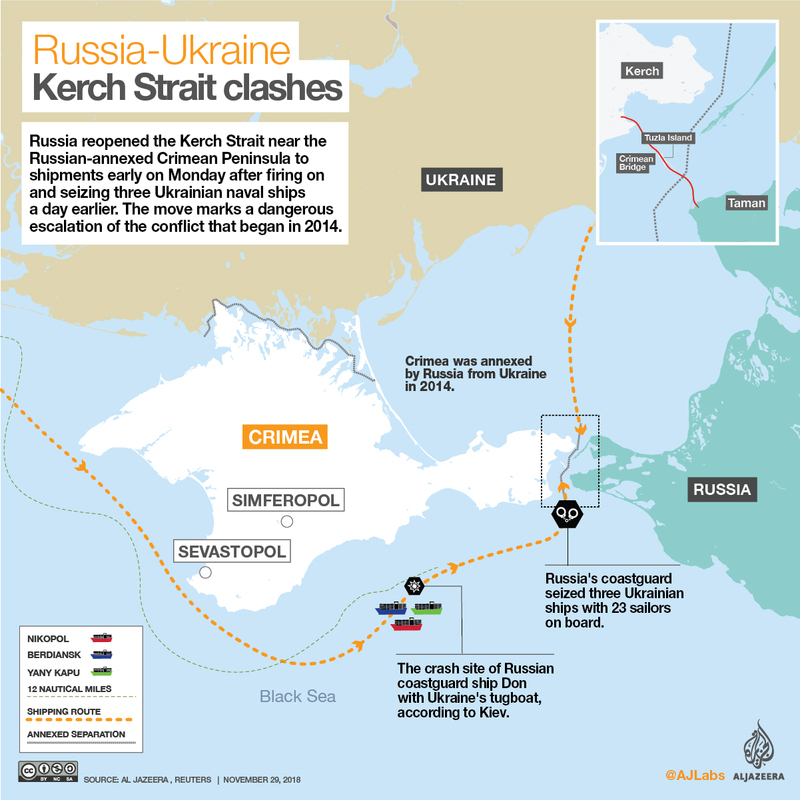 The tension between Ukraine and Russia reached a new low this week after the Russian border patrol blocked the route of three Ukrainian military vessels travelling from the Black Sea to the Sea of Azov through the Kerch Strait – the shared internal waters of both states according to their 2003 agreement. The seizure of the ships and the arrest of 24 crew members caused international outcry and condemnation of Moscow’s moves, including from US President Donald Trump who suggested that he might cancel his planned meeting with Russia’s President Vladimir Putin over the aggression. Putin’s foreign policy adviser Yuri Ushakov responded saying the meeting was “equally needed by both sides and important for the development of the general situation in the world”. Sergei Lavrov, Russia’s foreign minister, used stronger language, calling on Washington to stop encouraging “provocative” moves by Ukraine and instead mediate between Kiev and Moscow-backed rebels who claimed control of parts of Ukraine’s Donetsk and Luhansk regions in 2014. US encouragement for such acts “saddens me greatly”, he said. Makayev responded to the allegations, advising “anybody who listens to the Russian statement [on Ukraine provoking Sunday’s clash] to read George Orwell beforehand, because you would not understand the Russian false logic”. “Nobody [in Ukraine] is interested in warmongering. We are a peaceful nation. But we will defend our soil from the Russian aggression. We count on support of our American partners and we enjoy a full support also by the European Union,” he said. On Wednesday, a 30-day period of martial law took effect in 10 of Ukraine’s 27 regions, with President Petro Poroshenko saying it aims to prevent an all-out Russian invasion. The nine sailors were taken to the same detention centre in the Russian-controlled Ukrainian city of Simferopol on the peninsula as their 12 colleagues who faced the court a day earlier on Tuesday, Aider Azamatov, lawyer of Yuri Budzila – one of the detainees, told Al Jazeera. They are accused of illegal crossing of Russia’s maritime border, said Azamatov. “Of course, my defendant did not plead guilty. He understands that it is a political matter and the sailors are kept like hostages,” he said. “We started negotiations with our partners and possible mediators. We engaged the International Committee of the Red Cross to be intermediator in our talks with Russians,” said Makeyev.